Junior Middleweight Tyrone Brunson is looking for a major opportunity in 2018. 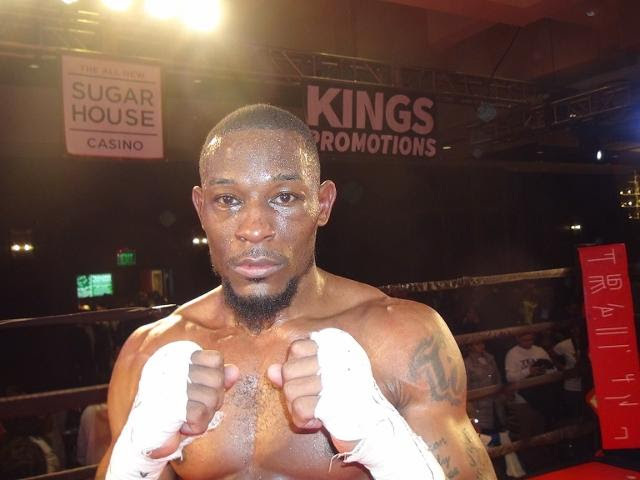 Brunson of Philadelphia will first need to get past Manny Woods this Friday night at the 2300 Arena in the ten-round main event of a loaded 12 bout card that is promoted by King’s Promotions. The 32 year-old is coming off the biggest when of his career when he stopped former two-time world champion Kermit Cintron in five rounds. The sure-fire Philadelphia Fight of the Year saw Brunson climb off the canvas twice before dropping Cintron three times in the pivotal round five. Despite not having a lot of knowledge of Woods, Brunson expects a great performance. In the potentially explosive eight-round co-feature, Brandon Robinson (7-1, 6 KOs) takes on Christopher Brooker (12-4, 5 KOs) in a super middleweight battle of fighters from Philadelphia. Jaron Ennis (16-0, 14 KOs) of Philadelphia takes on George Sosa (15-10-1, 15 KOs) of Reading, PA in a eight round welterweight bout. Omar Douglas (17-2, 12 KOs) of Wilmington, DE battles Martin Cardona (22-9, 14 KOs) of Guadalajara, MEX in a eight-round super featherweight bout. Kyrone Davis (12-1, 5 KOs) of Wilmington. DE fights Jaime Barbosa (19-12, 9 KOs) of San Jose, Costa Rica in a eight-round middleweight bout. Joe Hanks (21-2, 15 KOs) of Newark, NJ fights undefeated Joel Caudle (7-0-1, 5 KOs) of Raleigh, NC in a heavyweight tussle. In a six-round super bantamweight affair, Marcus Bates (7-0-1, 6 KOs) of Washington, DC fights Antonio Rodriguez (11-19-1, 5 KOs) of Durango, MX. Shamsuddeen Justice (1-0) of Philadelphia will fight Latorie Woodberry (1-5-1) of Roanoke, VA in a junior welterweight bout. Rasheed Johnson (2-1,1 KO) of Philadelphia, PA squares of with Kashon Hutchinson (3-3-1, 2 Kos) of Reading, PA in a welterweight contest. Undefeated heavyweight Colby Madison (4-0-1, 3 KOs) of Owings Mills, MD fights Randy Easton (4-9-2, 4 KOs) of Sunbury, PA.
Romuel Cruz of Philadelphia will make his pro debut against Rondarrius Hunter (1-1, 1 KO) of Atlanta, GA in a super bantamweight bout. Christopher Burgos (0-1) of Philadelphia battles Gerardo Tiburcio (1-0, 1 KO) of Coatesville, PA in a lightweight fight.